We return to Taylor punching the beach. It gets really interesting when for whatever reason these products wind up shortcircuited in some way, and they end up saying stuff that's subversive, or counter to the ethos of the machine producing them, or just plain weird. And franchise movies are actually, in an odd way, sometimes more prone to that. It's almost like the people making a franchise movie aren't necessarily in lockstep with the system they work for. 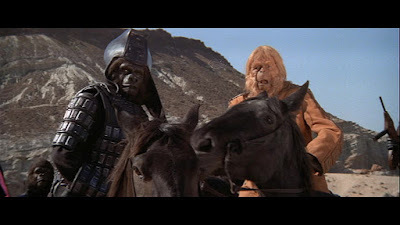 And one of the best parts of the 1998 documentary Behind the Planet of the Apes is where the studio head Richard Zanuck says words to the effect of "No, I don't think they're political, Planet of the Apes was just a fun series of movies," and immediately afterwards people who knew the scriptwriters say something like, "These films are almost entirely political and social allegory," and that's often how the interesting films get made, when the makers sneak things past the money men. And the other reason for weird sequels is a corollary to this, that the act of finding new variations on the same basic story by people with their own opinions opens up the story to being damaged in some way, vandalised with new semiotic features that transform its nature. 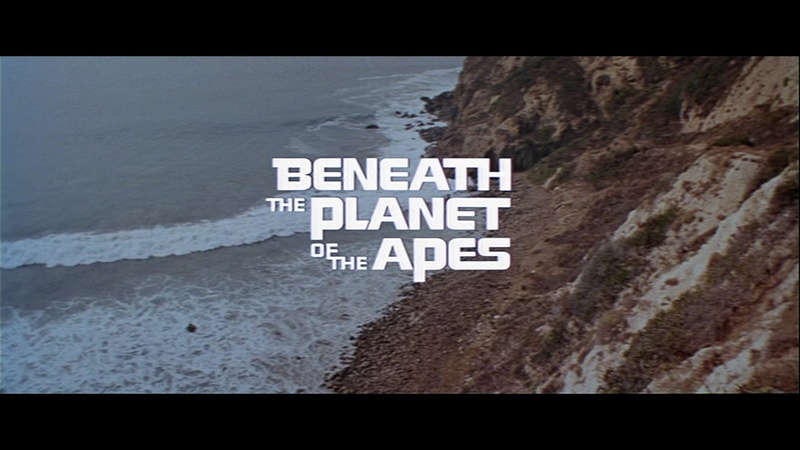 Which brings us to Beneath the Planet of the Apes. It's nowhere nearly as good as the original, let's get that out of the way. It's full of compromises of budget, of casting, of technical expertise (you can see that some of the second line extras in the crowd scenes are wearing pull-on masks rather than proper Ape makeup; entire sets are post-apocalypsed versions of sets from other movies). Well, of course they're going to mistake him for Taylor. 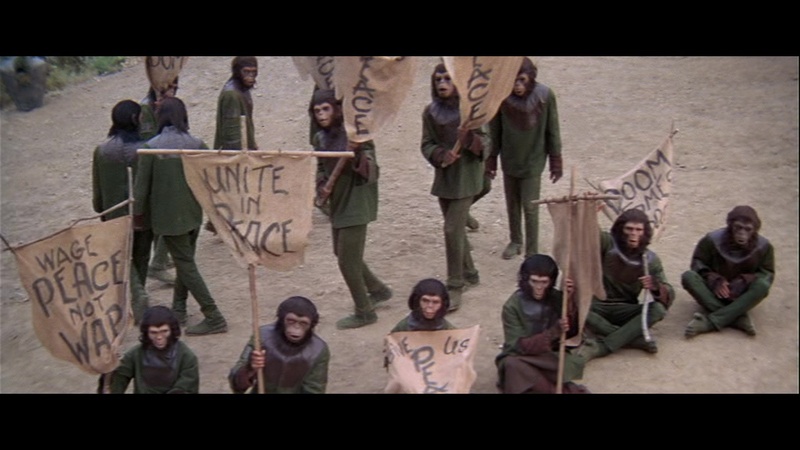 This is the first Planet of the Apes movie that has script input from Paul Dehn, and that's important. Dehn was, apart from a decent enough scriptwriter, a poet of no small ability, and even in the most far-fetched of the Apes films, you often hear these strangely beautiful cadences in the dialogue. In short, it's poetic. Dehn was also an ideas man, and it's with him that, as we'll see, the credit rests for continuing a series that is continually putting itself in a position where it doesn't look continuable. Beneath the Planet of the Apes is an undeniably weird film. It's a perverse opening for a franchise, it's a genuinely bizarre continuation of the story, and it's a film that makes it look impossible to make another sequel. As I've said before, it's the one time that the Planet of the Apes series goes completely bananas. The Planet of the Apes series has two main stories it tells. Either it's the story of human protagonists landing in a strange topsy-turvy world where the apes have gotten smarter and taken over from the humans and somehow navigating that, or it's the story of the apes getting smart and starting an ape revolution and throwing off the shackles of their human oppressors. And we haven't gotten to the second story yet. That's backstory, story worth telling, but which Planet of the Apes hasn't decided to tell yet. 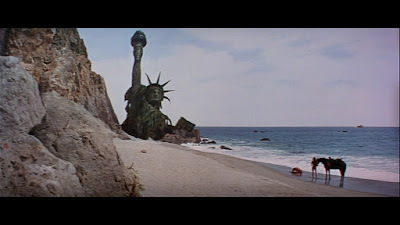 We've found the Statue of Liberty so we know the Planet of the Apes is future Earth, but there's a sense that we don't really know what to do with that, or what you do after finding that the wreckage of the Statue of Liberty has turned the cheery space opera you thought you were in into a grim post apocalyptic. And that's the first real aporia of the Planet of the Apes films. Once you've retrospectively collapsed the entire narrative (and you've completely wrongfooted anyone who's read the book) it seems that the story has nowhere to go. It's a satisfying ending. What do you do if the last of your certainties come crashing down around your ears and you're left with no option but to punch the beach because you've just found the Statue of Liberty? You keep riding, I suppose. 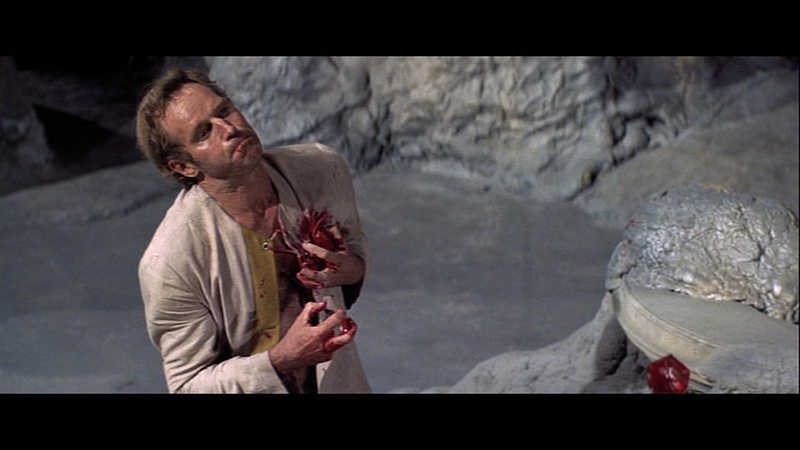 And that's what Taylor (still Charlton Heston, still gritting his teeth) and Nova (Linda Harrison) do, they ride on into the Forbidden Zone until they come across a barrier of supernatural flame and Taylor disappears into a rock wall. And that's the sort of plot development that Beneath the Planet of the Apes begins to throw at you, the sort that makes you blink and think, whaaaat? Another spaceship lands, again with a sole survivor. This man is Brent (James Franciscus), who looks a bit like Taylor only with somewhat less nuance and somewhat less gritting of teeth: Taylor, Only Not as Good. He's on a rescue mission, and apparently Dr Hasslein back home (we'll meet him in another film) has worked out that if you travel through the warp in the right direction you'll wind up in the same place. Brent's journey goes in much the same direction as Taylor's except he's lucky enough not to get caught before making it to the ape city, so he gets to be the unseen witness of an ape war council. Then Nova leads him to Cornelius (David Watson, not Roddy McDowall, but don't worry, this is temporary) and Zira (still Kim Hunter). They figure out who Brent is, help him to escape from being used as target practice by gorillas, and send him on his way, and then that's it for ape-human interaction until the end of the film. The apes do their thing, the humans do theirs, and five minutes or so from the end, everyone winds up in the same place and there's shouting and then, well. Let's rewind. But it's here he finds a race of superintelligent telepathic mutant humans who look all monastic and serene and who have the power to create illusions, and force people to kill each other, and torture people with their brains, and look really smug while they're doing it. And it's these guys who have Taylor locked up, because rhey don't really know what to do with him. And they spend a bit of time forcing Brent to beat up Nova and fight Taylor, apparently just for fun. Moving away from the story for a second, I have to give mention to the main woman mutant, Albina. 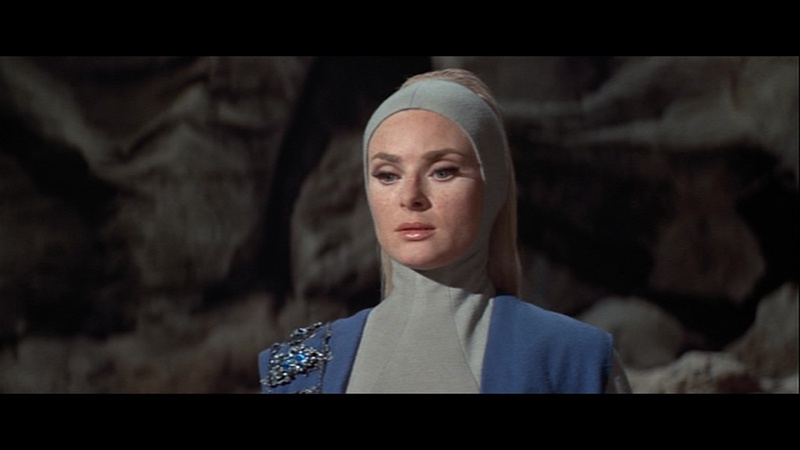 She isn't the most important character or anything, but she's worth paying attention to because she's played by Natalie Trundy, who isn't really terribly well known for much else, but who played three different characters, mutant, human and chimp, in four successive Planet of the Apes movies. And it's usually mentioned here that she was cast because she was producer Arthur P Jacobs's wife, and that might be true, but she's still a decent actor with a decent CV who takes on a variety of roles. Natalie Trundy, I unironically salute you. 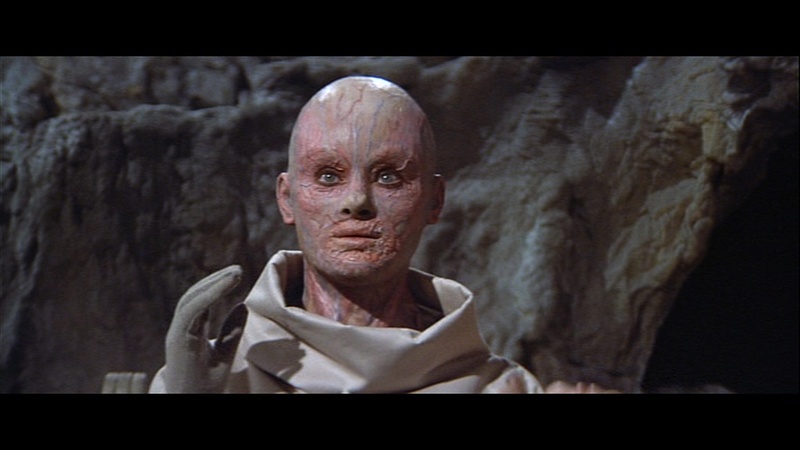 Anyway, all of the mutants, including Natalie Trundy, wear human masks; their real faces are sort of... raw. Skinless. 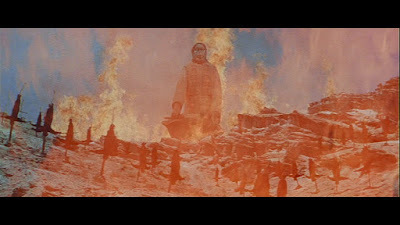 Also, they worship an unexploded atom bomb (and the church service where they sing hymns to the bomb is really the most bizarre scene in nine Planet of the Apes movies, a TV series and a cartoon. Nothing matches it. Nothing even comes close. It is deranged). ...even when you don't have an actual face. The apes meanwhile are busy doing what apes are supposed to do and aping human society in pointed ways. An ambitious gorilla general, Ursus (James Gregory) has convinced the apes to go to war against – well, no one is sure, but whatever is responsible for all the weird stuff happening in the Forbidden Zone. So Ursus whips up all the other gorillas into starting a war against an unknowable enemy outside of their borders, and the orangutan establishment, represented again by Dr Zaius (Maurice Evans), aren't terribly happy with this but they get on board with the war effort anyway, because they're the establishment, and as the young gorillas are marching off to war, they collide with a bunch of chimps doing a peaceful sit-in, with placards and stuff and of course the gorillas clear them away violently, and look, it's Vietnam, isn't it? It's so Nam it hurts. There is no way this is a political comment on the USA in 1970. Nope. When the army gets to the borders of the mutant territory, the mutants try to scare them off with illusory fire and visions of crucifed apes and a bleeding statue of the Great Lawgiver, and it freaks the apes right out until they realise that they're just illusions and so they go on and invade the underground realm for no real reason other than they're afraid of an enemy they don't even know exists. And meanwhile Taylor and Brent get out and try to escape, and of course they get caught up in the chaos. And now is the point where the whole Planet of the Apes story ends. Nova dies, and then Brent gets gunned down, and finally Taylor confronts Zaius one last time and then gets the bullet, but not before crawling over to the doomsday bomb and setting it off. Ending all life on Earth. And then a voice over tells us that, nope, no one survived. Dead planet, the end. And you just think, that escalated fast. I think it's a sign, as we'll see with the TV series and the 2001 Tim Burton version, that the limitations of the "Space Gulliver navigates a society where he's forced to be treated like an animal until he finds out he was on Earth all along" are palpable enough to make it a very difficult story to continue. Once you find the Statue of Liberty, there's nowhere else to go. It's a great ending, one of the best in film history in my opinion, but it's an ending, a state of Platonic aporia (and so much so that the image of the statue is on the DVD box, rather than, you know, apes). Charlton Heston recognised this, which is why he refused to come back unless he was killed off and claimed credit for the suggestion that he blow up the planet at the end. So there couldn't be any more sequels. And obviously Chuck's assumption that without him there'd be no point in sequels tells a story about the man on its own, but just because somebody stars in a film, it doesn't mean they understand what it is about it that matters. We're not here for Chuck, we're here for the apes. And where are the apes? They're pretty much missing for half the film, background to someone else's story. The apes have lost their planet. For this to continue, the apes are going to have to retake the planet and with nothing left, they're going to have to start from scratch.